Home / About Us / Nelson A. Madrid, Esq. NELSON A. MADRID is a partner with the law firm of Pollack, Pollack, Isaac & DeCicco, LLP. Mr. Madrid has extensive experience representing clients before the Executive Office for Immigration Review (Immigration Courts), the Board of Immigration Appeals, and the United States Citizenship and Immigration Services. Mr. Madrid is admitted and a member of: the New York State Supreme Court Appellate Division in the First Department (2008); United States District Court for the Eastern District of New York (2008); United States District Court for the Southern District of New York (2008); United States Court of Appeals for the 2nd Circuit (2009), and a member of the American Immigration Lawyers Association (since 2009). 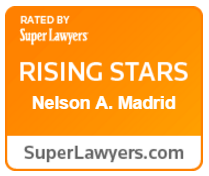 Mr. Madrid received an AV® Preeminent™ Rating by Martindale-Hubbell, and was recognized by Super Lawyers® as a Rising Star in 2017 and 2018.